Biotinylated Zika virus NS1, His Tag (NS1-Z82E9) is expressed from human 293 cells (HEK293). It contains AA Val 796 - Ser 1148 (Accession # ALU33341.1). The protein has a calculated MW of 43.3 kDa. The protein migrates as 46-50 kDa under reducing (R) condition (SDS-PAGE) due to glycosylation. Lyophilized from 0.22 μm filtered solution in PBS, pH7.4 . Normally trehalose is added as protectant before lyophilization. 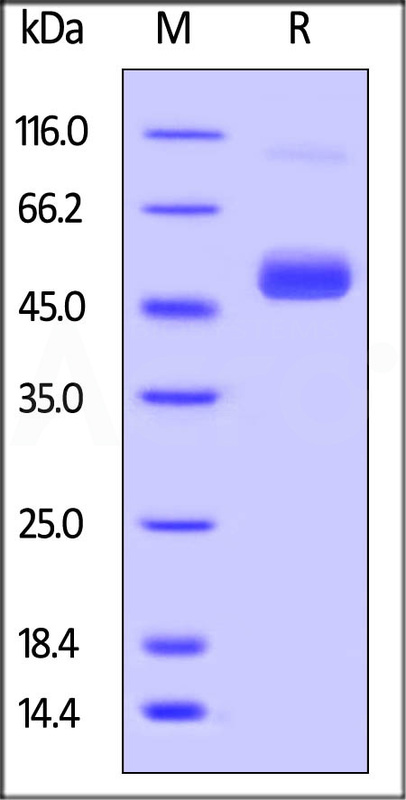 Biotinylated Zika virus NS1, His Tag on SDS-PAGE under reducing (R) condition. The gel was stained overnight with Coomassie Blue. The purity of the protein is greater than 90%. Zika virus (ZIKV) is a member of the virus family Flaviviridae and the genus Flavivirus, transmitted by daytime-active Aedes mosquitoes, such as A. aegypti and A. albopictus. Its name comes from the Zika Forest of Uganda, where the virus was first isolated in 1947. Zika virus is related to dengue, yellow fever, Japanese encephalitis, and West Nile viruses. The infection, known as Zika fever, often causes no or only mild symptoms, similar to a mild form of dengue fever. It is treated by rest. Since the 1950s, it has been known to occur within a narrow equatorial belt from Africa to Asia. As of 2016, the illness cannot be prevented by drugs or vaccines. As of February 2016, there is evidence that Zika fever in pregnant women is associated with abnormal brain development in their fetuses through mother-to-child transmission of the virus, which may result in miscarriage or microcephaly. (1) Emerg Infect Dis. 2014 Jun;20(6):1090. (2) Euro Surveill. 2014 Apr 10;19(14). pii: 20761.